View and photograph the best seasonal wildflowers Perth has to offer during this 8-hour tour. With your botanical guide, see everlastings, orchids, red and green kangaroo paw, banksias, bottle brush, and the famous orange flowering Christmas trees. Itinerary will be customized day-of to ensure the areas with the most abundant flowers in bloom at the moment are on the agenda. Lunch included. Begin your day of viewing and photographing Perth's abundant wildflowers by meeting your guide and group at Perth's Convention and Exhibition Centre. Board a comfortable tour vehicle and set out in search of the very best wildflowers in bloom at the moment. Travel through the outskirts of the city; the Darling Escarpment's rich soil and granite outcroppings make excellent growing locations for wildflowers. Once your botanical guide has determined your day's itinerary, travel to those locations and step out of the vehicle at each stop. 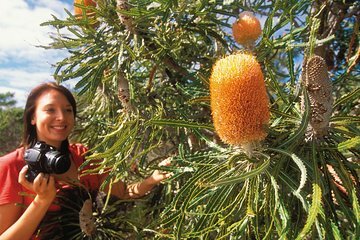 Listen as your guide helps you identify rare flowers and well-known flora such as orange flowering Christmas trees, bottle brush, banksias, green and red kangaroo paw, orchids, and everlastings. Have plenty of time to take photos and ask questions; you'll walk away with a complimentary wildflower booklet. Stop midway through the day for an included lunch. Saw plenty of wildflowers but group too large for one leader, who didn't wait for everyone to get off bus before walking off. So much of detailed information missed. Also organisation of hotel drop offs at end was poor. Needs rethinking to account for city centre traffic. Quite poor value for money compared with other trips. The wildflowers were beautiful, however, I think it was a little disappointing in terms of the tour guide's commentary. I was particularly offended by the description of the Grass Trees as Black Boys and Black Gins this is highly offensive to Aboriginal people and this person needs to be trained not to use these terms any more they are not acceptable.